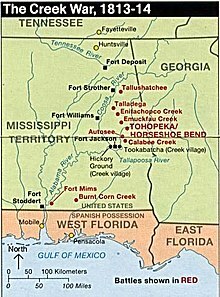 The Creek War (1813–1814), also known as the Red Stick War and the Creek Civil War, was a regional war between opposing Creek factions, European empires and the United States, taking place largely in today’s Alabama and along the Gulf Coast. The major conflicts of the war took place between state militia units and the “Red Stick” Creeks. The Creek War was part of the centuries-long American Indian Wars. It is usually considered part of the War of 1812 because it was influenced by Tecumseh’s War in the Old Northwest, was concurrent with the American-British war and involved many of the same participants, and the Red Sticks had sought British support and aided Admiral Cochrane’s advance towards New Orleans. The provinces of East and West Florida were governed by the Spanish, and British firms like Panton, Leslie, and Co. provided most of the trade goods into Creek country. Pensacola and Mobile, in Spanish Florida, controlled the outlets of the US Mississippi Territory’s (established 1798) rivers. Territorial conflicts between France, Spain, Britain, and the United States along the Gulf Coast that had previously helped the Creeks to maintain control over most of the United States’ southwestern territory had shifted dramatically due to the Napoleonic Wars, the Florida Rebellion, and the War of 1812. This made long-standing Creek trade and political alliances more tenuous than ever. During and after the American Revolution, the United States wished to maintain the which had been established by the Royal Proclamation of 1763. The Indian Line created a boundary for colonial settlement in order to prevent illegal encroachment into Indian lands, and also helped the U.S. government maintain control over the Indian trade. Traders and settlers often violated the terms of the treaties establishing the Indian Line, and frontier settlements by colonials in Indian lands was one of the arguments the United States used to expand its territory. In the Treaty of New York (1790), Treaty of Colerain (1796), (1802), and the (1805), the Creek ceded their Georgia territory east of the Ocmulgee River. In 1804, the United States claimed the city of Mobile under the . The 1805 treaty with the Creek had also allowed the creation of a Federal Road that linked Washington to the newly acquired port city of New Orleans, which partially stretched through Creek territories. The splintering of the Creek peoples along progressive and nativist lines had roots dating back to the eighteenth century, but came to a head after 1811. Red Stick militancy was a response to the economic and cultural crises in Creek society caused by the adoption of Western trade goods and culture. From the sixteenth century, the Creek had formed successful trade alliances with European empires, but the drastic fall in the price of deerskin from 1783 to 1793 made it more difficult for individuals to repay their debt, while at the same time the assimilation process made American goods more necessary. The Red Sticks particularly resisted the civilization programs administered by the U.S. Indian Agent Benjamin Hawkins, who had stronger alliances among the towns of the Lower Creek. Some of the “progressive” Creek began to adopt American farming practices as their game disappeared, and as more Anglo settlers assimilated into Creek towns and families. Leaders of the Lower Creek towns in present-day Georgia included Bird Tail King (Fushatchie Mico) of Cusseta; Little Prince (Tustunnuggee Hopoi) of Broken Arrow, and William McIntosh (Tunstunuggee Hutkee, White Warrior) of Coweta. Many of the most prominent Creek chiefs before the Creek War were “mixed-bloods” like William McGillivray and William McIntosh (who were on opposing sides of the Creek Civil War). The Americanization of the Creeks was more prevalent in western Georgia among the Lower Creeks than in Upper Creek Towns, and came from internal and external processes. The US government’s and Benjamin Hawkins’ pressure on the Creeks to assimilate stood in contrast to the more natural blending of cultures that came from a long tradition of cohabitation and cultural appropriation, beginning with white traders in Indian country. Creeks who did not support the war became targets for the prophets and their followers, and began to be murdered in their sleep or burned alive. Warriors of the prophets’ party also began to attack the property of their enemies, burning plantations and destroying livestock. The first major offensive of the civil war was the Red Stick attack on the Upper Creek town, and seat of the council, at Tuckabatchee on July 22, 1813. In Georgia, a war party of “friendly” Creek organized under William McIntosh, Big Warrior, and Little Prince attacked 150 Uchee warriors who were traveling to meet up with Red Stick Creeks in the Mississippi Territory. After this offensive in the beginning of October 1813, the party burned a number of Red Stick towns before retiring to Coweta. Chiefs Peter McQueen and William Weatherford led an attack on Fort Mims, north of Mobile, on August 30, 1813. The Red Sticks’ goal was to strike at mixed-blood Creek of the Tensaw settlement who had taken refuge at the fort. The warriors attacked the fort, and killed a total of 400 to 500 people, including women and children and numerous white settlers. 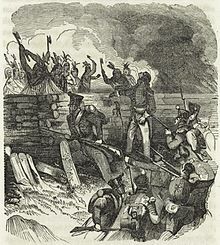 The attack became known as the Fort Mims Massacre and became a rallying cause for American militia. In addition to the state actions, U.S. Indian Agent Hawkins organized the friendly (Lower Town) Creek under Major William McIntosh, an Indian chief, to aid the Georgia and Tennessee militias in actions against the Red Sticks. At the request of Chief Federal Agent Return J. Meigs (called White Eagle by the Indians for the color of his hair), the Cherokee Nation voted to join the Americans in their fight against the Red Sticks. Under the command of Major Ridge, 200 Cherokee fought with the Tennessee Militia under Colonel Andrew Jackson. At most, the Red Stick force consisted of 4,000 warriors, possessing perhaps 1,000 muskets. They had never been involved in a large-scale war, not even against neighboring American Indians. Early in the war, General Cocke observed that arrows “form a very principal part of the enemy’s arms for warfare, every man having a bow with a bundle of arrows, which is used after the first fire with the gun until a leisure time for loading offers.” Many Creek tried to remain friendly to the United States; but, after Fort Mims, few European Americans in the region distinguished between friendly and unfriendly Creeks. The Holy Ground (Econochaca), located near the junction of the Alabama and Coosa Rivers, was the heart of the Red Stick Confederation. It was about 150 miles (240 km) from the nearest supply point available to any of the three American armies. The easiest attack route was from Georgia through the line of forts on the frontier and then along a good road that led to the Upper Creek towns near the Holy Ground, including nearby Hickory Ground. Another route was north from Mobile along the Alabama River. Jackson’s route of advance was south from Tennessee through a mountainous and pathless terrain. By August, the Georgia Volunteer Army and state militia had been mobilized in anticipation of war with the Creeks. The news of Fort Mims first reached Georgia on September 16, and was taken as legal grounds to begin a military offensive. In addition, Benjamin Hawkins wrote to Floyd on September 30 that the Red Stick war party had “received 25 small guns” at Pensacola. 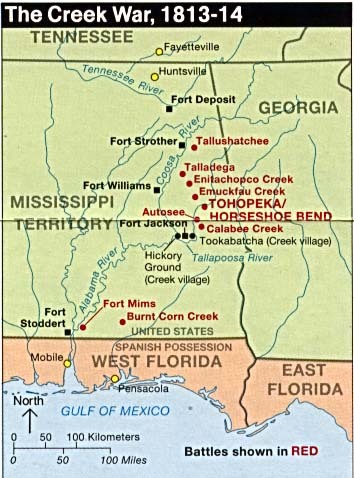 The immediate concern of the force was the defense of Georgia’s “Indian Line”, separating Indian territory from U.S. territory at the Ocmulgee River. The proximity of Jasper and Jones counties to hostile Creek towns resulted in a regiment of Georgia volunteer militia under Major General David Adams. John Floyd was made general of the main Georgia army (in September 1812 and numbering 2,362 men). The Georgia Army was aided by Cherokee and independent Creek allies, as well as a number of Georgia volunteer militia. Floyd’s task was to advance to the junction of the Coosa and Tallapoosa rivers and join the Army of Tennessee. Due to the state’s failure to secure supplies early enough in the year, Floyd gained a few months to train and drill the men at Fort Hawkins. On November 24, General Floyd crossed the Chattahoochee and established Fort Mitchell, where he was joined by 300-400 Creek from Coweta, organized under McIntosh. With these allies and 950 of his men, Floyd began his advance towards the juncture of the Coosa and Tallapoosa Rivers where he was supposed to rendezvous with Jackson. His first target was the major town of on the Tallapoosa River, a Red Stick stronghold only 20 miles from the Coosa River. On November 29, he attacked Autossee. Floyd’s losses were 11 killed and 54 wounded. Floyd estimated that 200 Creek were killed. Having achieved the destruction of the town, Floyd returned to Fort Mitchell. The second westward advance of Floyd’s troops departed Fort Mitchell with a force of 1,100 militia and 400 friendly Creek. Along the way they fortified Fort Bainbridge and on the federal road. On January 26, 1813, they set up a camp on the Callabee Creek near the abandoned site of Autossee. Red Stick chiefs William Weatherford, Paddy Walsh, , and William McGillivray raised a combined force of at least 1,300 warriors to stop the advance. This was the largest combined force raised by the Creek during the entire war. On January 29, the Redsticks launched an attack on the American camp at dawn. After daylight, Floyd’s army repulsed the attack. Casualty figures vary for Floyd’s force, from 17 to 22 killed, and 132 to 147 wounded. Floyd estimated Red Stick casualties as 37 killed, including Chief High-head Jim. Georgia retreated to Fort Mitchell with Floyd, who was severely wounded in the leg. The “Battle of Calebee Creek” was Georgia’s last offensive operation of the war. In October, General organized a force of about 1,000—consisting of the Third United States Infantry, militia, volunteers, and Choctaw Indians—at Fort Stoddert. General Claiborne, ordered to lay waste to Creek property near the junction of Alabama and Tombigbee, advanced from . He achieved some destruction but no military engagement. At roughly the same time, Captain Sam Dale left Fort Madison (near Suggsville) going southward to the Alabama River. On November 12 a small party rowed out to intercept a war canoe. Dale wound up alone in the canoe in hand to hand combat with four warriors. Brigadier General Joseph Graham’s brigade of troops from North and South Carolina (included Colonel Nash’s South Carolina militia) deployed along the Georgia frontier to deal with the Red Sticks. Colonel Reuben Nash’s South Carolina regiment of volunteer militia traveled from South Carolina at the end of January 1814. The militia marched to the start of the Federal Road in Augusta, Georgia, walking to Fort Benjamin Hawkins (in modern Macon, Georgia) en route to reinforce the various forts including Fort Mitchell, Alabama (in modern Phenix City, Alabama). Other companies in the Nash’s regiment were at Fort Mitchell by July 1814. Graham’s brigade participated in only a few skirmishes before returning home. Although Jackson’s mission was to defeat the Creek, his larger objective was to move on Pensacola. Jackson’s plan was to move south, build roads, destroy Upper Creek towns and then later proceed to Mobile to stage an attack on Spanish held Pensacola. He had two problems: logistics and short enlistments. When Jackson began his advance, the Tennessee River was low, making it difficult to move supplies, and there was little forage for his horses. After Talladega, however, Jackson was plagued by supply shortages and discipline problems arising from his men’s short term enlistments. Cocke, with East Tennessee Militia, took the field on October 12. His route of march was from Knoxville to Chattanooga and then along the Coosa toward Fort Strother. Because of rivalry between the East and West Tennessee militias, Cocke was in no hurry to join Jackson, particularly after he angered Jackson by mistakenly attacking a friendly village on November 17. When he finally reached Fort Strother on December 12, the East Tennessee men only had 10 days remaining on their enlistments. Jackson had no choice but to dismiss them. Furthermore, General Coffee, who had returned to Tennessee for remounts, wrote Jackson that the cavalry had deserted. 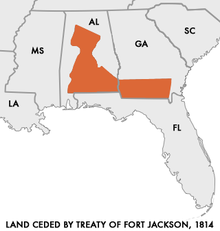 By the end of 1813, Jackson was down to a single regiment whose enlistments were due to expire in mid-January. Although Governor Blount had ordered a new levee of 2,500 troops, Jackson would not be up to full strength until the end of February. When a draft of 900 raw recruits arrived unexpectedly on January 14, Jackson was down to a cadre of 103 and Coffee, who had been “abandoned by his men”. The arrival of the 39th United States Infantry on February 6, 1814, provided Jackson a disciplined core for his force, which ultimately grew to about 5,000 men. After Governor Blount ordered the second draft of Tennessee militia, Cocke, with a force of 2,000 six-month men, once again marched from Knoxville to Fort Strother. Cocke’s men mutinied when they learned that Jackson’s men only had three-month enlistments. Cocke tried to pacify his men, but Jackson misunderstood the situation and ordered Cocke’s arrest as an instigator. The East Tennessee militia reported to Fort Strother without further comment on their term of service. Cocke was later cleared. ^ a b Thrower. “Casualties and Consequences of the Creek Civil War.” in Rethinking Tohopeka, 12. ^ Braund, “Red Sticks”. Rethinking Tohopeka. 89-93. ^ Note: Company muster rolls of Captain John Wallace (one of Nash’s companies) list the company near Fort Hawkins on Feb. 9, near Fort Jackson (Alabama) on May 13, and near Fort Hawkins on July 13. Holland, James W. “Andrew Jackson and the Creek War: Victory at the Horseshoe Bend”, Alabama Review, 1968 21(4): 243–275. Kanon, Thomas. “‘A Slow, Laborious Slaughter’: The Battle Of Horseshoe Bend.” Tennessee Historical Quarterly, 1999 58(1): 2–15.